Sun Boxes are Coming to Vermont State Parks! 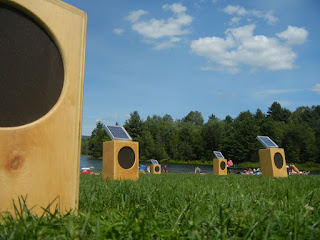 Sound artist Craig Calorusso is bringing his latest musical performance project, Sun Boxes, into five state parks for five weekends this summer. It's comprised of twenty speakers spread over a large, open lawn operating independently, each powered by the sun via solar panels. Inside each Sun Box is a PC board that has a recorded musical programmed to play continuously in a loop. Because the loops are different in length, once the piece begins they continually overlap and the piece slowly evolves over time. Quechee State Park is hosting a free community event on Saturday, June 30th from 10:00 am - 2:00 pm. Park entry is FREE for this event. You can also enjoy a hike in the gorge and many fine local shops. Everyone is welcome, even if you're not a neighbor. Check out our events page for more fun stuff going on in the parks this summer. Parks are wonderful in many ways. They inspire people, they are relaxing and, for many species of wildlife, the final bastion of survival. They are often hotbeds of biodiversity and a place many go to study the natural world around them, gather samples and eat outdoor lunches. However, their ability to provide hands-on learning to children about the environment and biology is one of the most valuable functions of parks. The life of a Vermont State Parks employee working at Elmore State Park has its perks. On any given day my job description may consist of kayaking out into the lake to take water sample, working alongside our knowledgeable and engaging park staff, and enjoying being outside in the most beautiful state in the country. One thing that is unfortunately not in my job description is using all of our toys and equipment that we keep in the closet of our contact station. One day while getting myself situated for work I stumbled across this closet that I never knew existed. It was filled with a badmitton set, horseshoes, a croquet set, and more frisbees than I had seen in my entire tenure of walking the quad at college. Do you love Vermont's trails? Do you want to return some of that love? If so, grab a tool or two and meet at Big Deer campground at 9:00 am, June 16th for a fun filled day of building a trail followed by a BBQ at Boulder Beach. Come see first hand what our summer trail crews do all summer long and learn how to build a trail. Our summer trail crews roam around the state building and maintaining many of Vermont's trails. We will meet at 9:00 AM and work till 3:00 PM. Thanks for the enthusiasm and we look forward to the weekend!